The overriding truth for any geologist is: Field-work is everything! There is simply no replacement for time with boots on the ground, hammer, compass and lens in hand. And this is not only true for the field work on projects, but also for building on and maintaining the very diverse set of skills that geologists must have. This year, Mineco co-sponsored a field trip to Namibia, organised by the SEG Chapter of Imperial College London. This also enabled Richard from the London office to participate in the trip as part of Mineco’s Continuing Professional Development (CPD) programme. 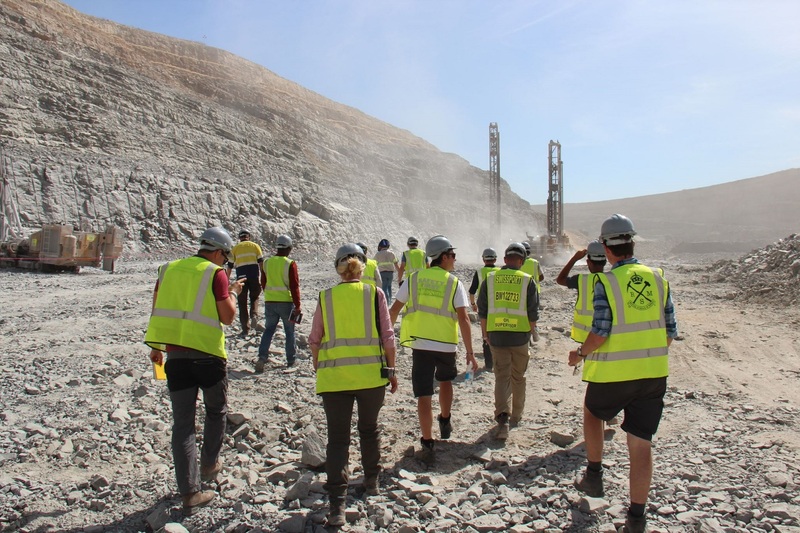 Over 11 days the group of students from Imperial College and other industry professionals (from SRK exploration, RioTinto and Osino Resources) visited 8 mining and exploration projects in the North of Namibia. Namibia is a fascinating country: it has less than 3 million inhabitants across the nation’s area that is 4x the size of mainland Great Britain. Most of the country is covered in red-sanded arid savanna of the Kalahari and Namib desert. The native wildlife is absolutely stunning, which makes safari tourism very popular, and the Namibians are a very friendly and welcoming people. The geology of Namibia is one of the most diverse in the world, which is reflected by a mining sector that makes a significant contribution to the national GDP and produces a wide set of commodities. A significant part of Namibia’s mineral wealth is concentrated along the collision zone between the Congo and Kalahari craton (craton = a very old and thick piece of earth crust), called the Damara Belt, which was formed approximately 520Ma ago and was the focus of the field trip. This collision belt consists of folded and thrusted metamorphic rocks which were then intruded by magmatic rocks, such as granites or granodiorites. To make this understandable to non-geologists: the combination of compression and heat in the regional geology is a good sign that there could have formed significant mineral deposits in this area. Located around 2.5hrs from Swakopmund, the Uis tin project has been in artisanal and industrial production at various times in the last 90 years, and is currently under development by the company Afritin. Geologically, the deposit was formed by the significant magmatism in the area, which generated what geologists describe as pegmatites, meaning magmatic rocks with unusually large crystals. This special type of rock can often contain a high concentration in rare elements, such as lithium, tin, tantalum and niobium, metals that are highly sought after to make the technology that we use every day. The Uis tin deposit mostly holds tin and some tantalum mineralisation. Instead of developing a highly defined resource by conducting vast amounts of exploration drilling, the company decided to build a pilot processing plant to get a much better measure of the present mineralisation and value that can be extracted, than what could be achieved by drilling only. The project manager Tim and the exploration geologist Warrick gave us a detailed tour of the deposit and the historic mining pits, allowing us to get a valuable insight into pegmatite formation and sparking discussions about metal sources and magmatic fractionation processes. It was a great day spent at the mine – thanks Tim & Warrick for having us. The visit to B2Gold’s Otijkoto mine was another highlight from the field trip. The gold mine is lies approximately 3 hours drive north of Windhoek and is operated by B2 Gold, a Canadian gold mining company. The Otijkoto gold deposit is what is called an orogenic gold deposit, meaning that the deposit formation is associated with the collision of cratons, complex deformation processes and the concentration of gold in rock structures by fluids from deeper crustal sources. The work of the local geologists therefore is very focused on the identification of rock units within the local stratigraphy, as well as the anticipation of the structures which are hosting the highest gold mineralisation. The mine has been operating in over the last three years and is working two open pits currently, extracting up to 10 million tons of ore per year at a head grade of 1 to 1.4g/t Au. B2Gold’s efforts in environmental, as they are in the process of creating a wildlife reserve the size of over 3000 square kilometres, which would link up to the Waterberg reserve and allow wildlife to roam more freely in the country. It was a fantastic time in Namibia and I would love to come back one day! (Picture - Group in the Otjikoto Main Pit).